Part 1 of a series looking into what the most expensive stadium deal in history could mean for the city. On a hazy February day, the massive stadium project under construction could barely be seen through the floor-to-ceiling windows of the ninth-floor meeting room at Inglewood City Hall. There was plenty of time to enjoy the view while waiting for the mayor, who had championed the world's most expensive stadium deal in football history, in a city once on the brink of bankruptcy. 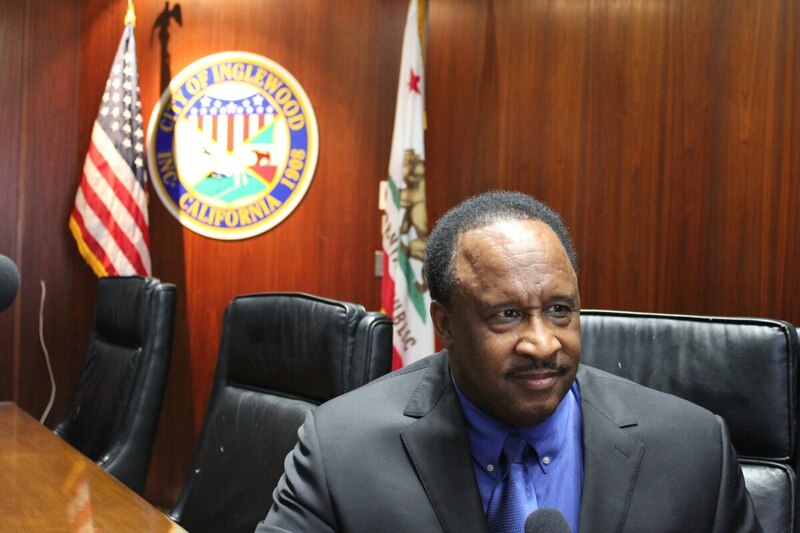 "The process starts when you position your city so that it's a viable venue or destination for the NFL to land, and that started back in 2011 when we totally remade city government here," boasted Inglewood Mayor James T. Butts, Jr. "We were down to our last $11 million. We were burning $50,000 a day more in expenditures than we made in revenues." Peering out over the site, it's easy to imagine Butts reveling in the view of the up-and-coming kingdom. He beamed as he described his feat of luring a sports team back to Inglewood. "We had the best project on the largest contiguous block of land in Southern California that would be more than just football," Butts said. "It became, in effect, NFL Disneyland and our version of LA Live and the Grove all mixed together." 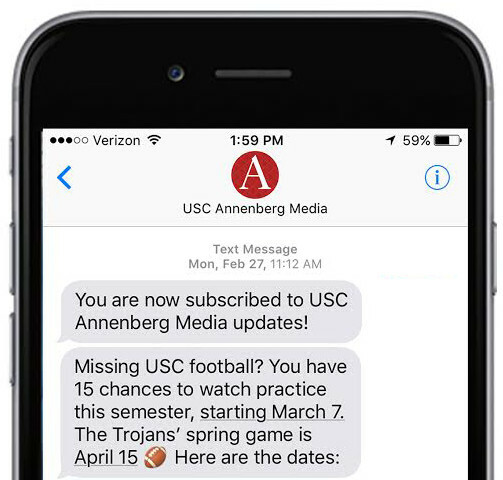 This spring, 14 reporters from Annenberg Media set out to investigate what the 60,000-to-100,000-seat year-round sports and entertainment destination soon-to-be home to the Los Angeles Rams will mean for the city. Speaking to the mayor about the stadium development, it was clear he could go on for quite some time about his many accomplishments surrounding the deal. He did so for 10 of the 16 minutes of our interview. He became less talkative, however, when we tried weeks later to set up follow-up interviews to discuss community members' concerns about the project. Butts' enthusiasm at first glance would appear to match that of his constituency. The project was driven by a 155-page City of Champions Revitalization Initiative, which garnered tens of thousands of signatures in support of the proposed project in less than three weeks. Citing widespread public approval, the City Council chose to fast-track the development, voting it into law rather than putting the question to voters, a time-saving strategy allowed by the California Environmental Quality Act. "So when you talk about citizen involvement—about 22,000 citizens were involved after a process that consisted of probably 15-20 community meetings on the topic, and signature-gathering drives." Butts said. Annenberg Media reporters found a nuanced view of the project's potential. Venturing into the area surrounding the construction site, we spoke to small business owners and residents who expressed a mixture of excitement and uncertainty–even a lack of trust. While almost all of the business owners interviewed acknowledged the potential for the project to increase foot traffic, and compared Inglewood's future to a more successful time almost two decades ago when the Lakers and Kings played at the Forum, uncertainty still loomed. For some, a lack of clarity as to what exactly the stadium could mean for small business owners and residents has left them feeling blindsided. "Basically we're in the dark and most of these are minority-owned business. So we don't know," said Desmond Sutherland, manager of his father's family-run business, Lee's Caribbean Restaurant and Market on Prairie Avenue. "They're fixing up the area. So If they're pumping up the area, it's going to affect certain people." Still, Mayor Butts, an ex-police chief of Santa Monica, has undeniably landed a groundbreaking project and an NFL team in his city–developments he said could transform its economy. "Here's what I learned from my time in Santa Monica and my first experience in Inglewood when we were the home for the showtime Lakers, the Kings and when the racetrack was in full effect," said Butts of repairing Inglewood's economy. "Cities that depend on their indigenous sales tax population, they get by in the best of times and struggle in every recession so that's a big plus in the city of Inglewood." The idea is that when folks from outside communities come into a city like Inglewood and spend, Inglewood keeps that sales tax. But when the new stores open more central to the stadium's location, the concern of some is that those new businesses will reap the benefit while older small businesses will be left in the lurch. "They won't be direct competition to the type of retail and dining that will be in the entertainment core. Those will be more upscale and high-end," Butts said. "Where the businesses that exist right now will benefit—particularly those along the corridor—they will benefit from what I call opportunity sales." Opportunity sales, however—those made when Inglewood event-going visitors realize they can get what they need locally—might sound a bit like consolation prizes to those unsure of their plight. Breaking it down on an individual level, when asked how the stadium project might affect people who have operated businesses or lived in Inglewood for decades, and what they could expect to see on a day-to-day basis, the mayor had much to say. "Oh my goodness . . . They'll see more police officers, more park hours, more library hours, the ability to replenish our capital infrastructure faster than we did before. So this is a total win for the citizens of Inglewood," Butts said. "Their streets will be paved more often. Their sidewalks will be repaired more often. They'll have more recreational opportunities and longer library hours." More, more, more, including growth for the city's real estate market, which has increased over 85 percent since 2012—just one year after Butts said he and his City Council began their major revamp of the city's government and infrastructure in preparation for negotiations with the NFL. "For most people their home is their single largest investment," Butts said. "So what we've seen happen in the real estate market is that when a house is put up for sale, by the end of the day there are five or six offers for the property at $10,000 to $50,000 above the asking price." The more we tried to get Butts to address some of the concerns we'd heard in our interviews with home and business owners just steps away from the soon-to-be stadium, the more defensive the mayor became. When the word "gentrification," was uttered, Butts assumed we didn't know what the word meant. "Did you say a gentrification threat? And you're a college student right?" Butts asked. The specifics, he said, don't line up. Middle and upper-middle class are not moving into depressed properties and improving them so that the housing is no longer affordable for those formerly living in the area. "What's happening here is we have a turnover of properties, but they're not depressed properties—they're upper-middle class properties. And there has been some mix in the demographic that lives here but it's been done along socioeconomic lines," Butts said. The mayor explained why he felt it necessary to elaborate on the subject. "I get that a lot," said Butts. "The unspoken thing that they're saying is that, 'Oh non-Black and Hispanics are going to move into the area,' as if that is some pejorative thing for a city. But it's no less a racist connotation than it was in the '60s." After the investigative team concluded our community research, we sought a second interview with Mayor Butts so he could directly address the concerns identified by his constituents. Executive Assistant to the Mayor and City Manager Melanie McDade denied our interview request and instead provided the mayor's brief written responses to our questions. In response to a question wondering what trade-offs the community might have to make to welcome such a development, Butts responded that more traffic would contribute to jobs and revenue reminiscent of the days when the Kings and Lakers played at the Forum. A question inquiring about any plans to help those who might be hurt by the project was considered "loaded" and "nonsensical" because it was a "scenario that had not manifested itself . . . anywhere that has major sports or concert venues." The Annenberg team had hoped to engage in a more productive conversation with the mayor. A final set of questions – our third attempt to get the mayor's responses to issues raised by the community — however, went unanswered. Most of the business owners and employees we interviewed assumed there would be aid for upgrades, or incentives for them to relocate if their landlords sell. When asked directly to respond to concerns raised by community members who feel in the dark, the mayor had this response: "Ridiculous question."